I have a dislike for incense sticks. Perhaps because I have a sensitive nose and since childhood I've smelled a whole array of very strong, overpowering incense sticks, many of them no doubt filled with artificial fragrances. Growing up in India we were told that in the olden days incense and oil lamps were burned at dusk just outside of one's doorway to invite in the light and keep the darkness or evil away. But I, although easily fascinated by magical rituals, think there is more to the story. Lamps at every doorway or veranda in the village would be to help to find your way in the darkness obviously and I think incenses, burning of herbs and resins would serve a very practical purpose of repelling insects and mosquitoes, and of course smelling nice. But this simple, beautiful ritual seems to have somehow lost its magic on me when one’s neighbours burn artificial chemicals smelling incenses outside their doors in enclosed landing spaces, making one choke while climbing the stairs home. Every evening! A few years ago however, I discovered a ritual which resonates with my Indian roots, but one which I find more ritualistic - the Native American tradition of smudging. Burning actual herbs, no added anything. Traditionally, smudging is done to cleanse a space or a person of negative energies and bad spirits. They would also have used the smoking of herbs as a way to administer medicine and treat ailments. Now, scientific studies are now beginning to prove that burning of medicinal herbs reduces airborne bacteria. One conducted in 1991 and another in 2007 both confer that smoke produced from burning medicinal herbs (each studied different ones) can reduce airborne bacteria sometimes by up to 94% and in a few cases certain pathogenic bacteria were still undetectable a month later. Here’s what is interesting, if I were to define bad spirits in the simplest of terms - unseen, invisible kind of omnipresent beings which can cause us harm perhaps sounds appropriate? What about defining bacteria in the simplest of terms? Unseen, invisible kind of omnipresent beings which could cause us harm. Sounds appropriate? There is also mention about the positive ions in the air (caused due to stress, tension etc.) being turned into negative ions with smudging too. But don’t take my word for it, look it up. Smudging or some form of it has existed in ancient cultures all over the world. In the Asian subcontinent it was Frankincense before the Church adopted it as well, Native Americans burned White sage or sagebush and the South Americans used Palo Santo. So has cleansing been noted as a ritual in most cultures, spring cleaning for example – opening all the windows, let the light in and breeze flow through, let all the stagnant air out and deep cleaning the house. They go hand in hand. For me the act of smudging itself is immersive one. It feels rooting, connecting to something ancient. There is something mesmerising about watching the smoke rise through the herb and slowly blowing on the embers watching the red glow take hold. I find that smudging is also an act of intention. I intentionally go into every room and wave smudge stick or blow the smoke into every corner, willing any stagnant air, bacteria, moths and such to be gone. 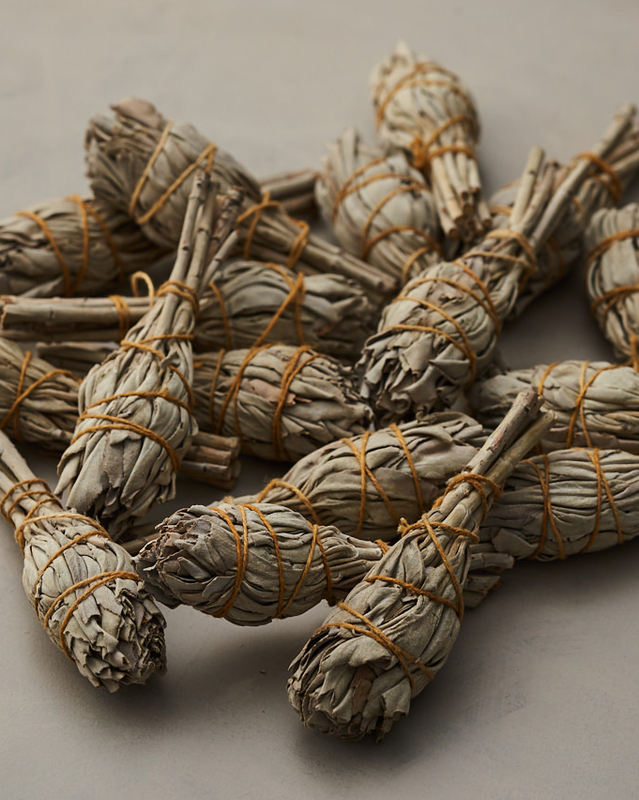 Smudging demands attention and time and that’s not a bad thing. Of course I don’t know if any of this actually works! But it feels good to do it. A small part of slowing down. We care for our bodies so much, it feels good to care for the space we call home. Ever since I discovered it, I use smudging at the turn of every season but also when someone has been ill. The idea of the home being full of bacteria and viruses from all the sneezing and coughing is not a pleasant one. I feel that now, these days there are probably more ‘invisible beings’ that can cause us harm and they are more stubborn than ever before. So it surely does no harm to cleanse ones home with smudging whether for spiritual reasons or more practical ones. I love the fact that it is so natural. Literally a bunch of dried herbs and fire. Simple, basic, primal. And here are some links to the studies I mentioned above.